After Mom passed away, we "kids" re-discovered letters that our parents wrote to one another during theWar. The Sentiment and the penmanship were both so beautiful. The treasure of it filled us with joy. 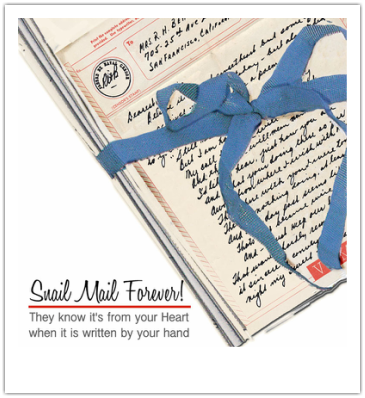 "I hope we have snail mail forever!" I exclaimed. There is so much personality in handwriting. Anything hand-addressed is always the first item of mail we open. The mission that follows is to create personalized, custom stationary designed to inspire heartfelt, handwritten communications. The goal is to embrace life's celebrations and milestones with uniquely personal and highly customized printwork that captures those elements most important to you and those you gift. The Snail has inched it's way into Invitations, Announcements, Calling Cards, Gift Tags, Greeting Cards, gift items and more! Take a look... the Snail hopes you will be inspired!